I might as well start with a Mea Culpa. Even with the best advice, from three friends, we managed not to be organised enough to go to the Reichstag, the German Parliament building and see the amazing glass dome. The best advice is to do a detailed registration early perhaps online, have breakfast or coffee at the Kafer, the rooftop restaurant and beat the crowds. Visit the official website for information: bundestag.de The Reichstag books out early, plan ahead. One other mea culpa was not leaving at least one day for Potsdam. As it turned out, our last day in Berlin, James wasn’t well and so we stayed close to the hotel. Four days for Berlin is not enough. Potsdam is a worthy place to visit by all accounts. 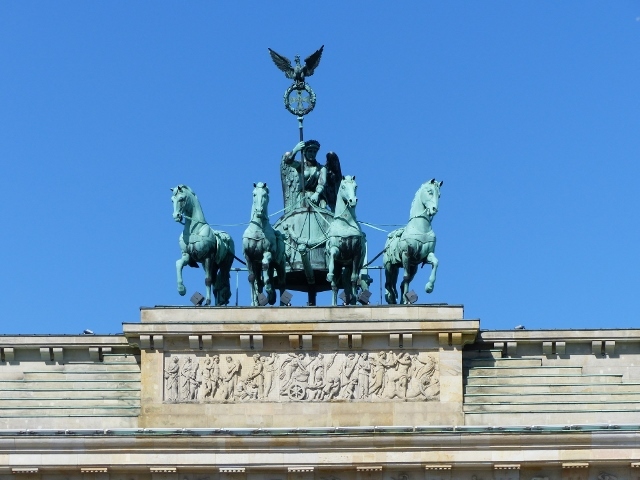 Berlin is a city of museums, galleries, history, music and culture. Museum Island was incredible with several museums of sterling quality on the northern half of this small island. 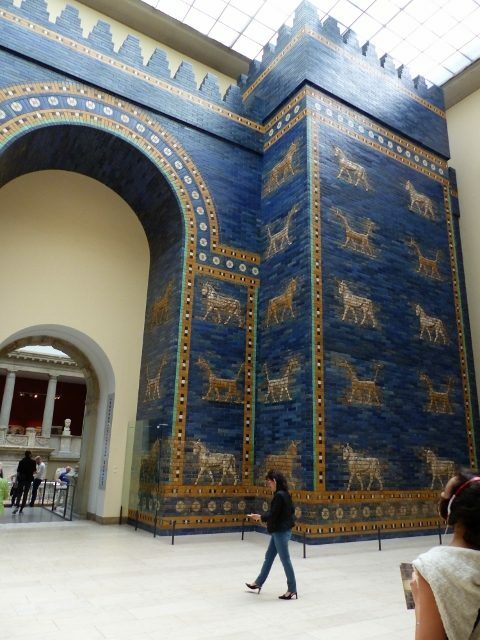 My favourite was definitely the Pergamon Museum, with the Pergamon Altar, the Hittite carvings and the Ishtar Gate. As a young student, we read about Babylon and Nebuchadnezzar and the Hanging Gardens of Babylon, the king had his 8th magnificent Gate made out of glazed brick. Saying I was overwhelmed seems fairly prosaic but this gate is beautiful and beyond what I had imagined. What do you think? Now I try to imagine what the Hanging Gardens looked like. 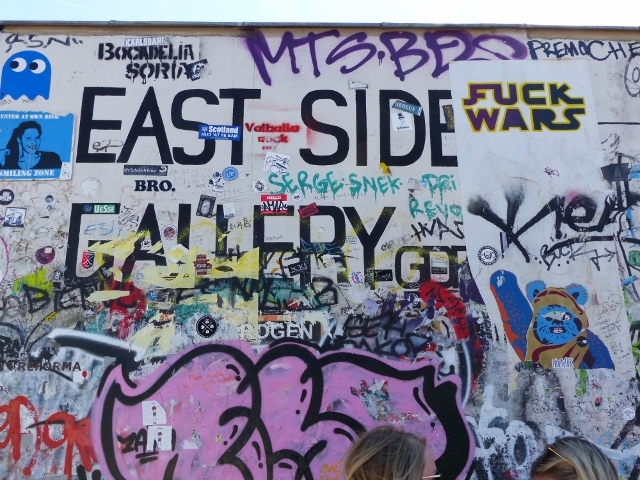 Near the centre of Berlin, we visited the Eastside Gallery, over a kilometre of the Wall is here and much of it is covered in graffiti and essentially it is a monument to freedom. It wasn’t just a wall but several parallel walls, with glass and barbed wire to keep people in. Visiting the East Side Gallery did let me feel like I was in East Berlin. After visiting several museums and going out to CheckPoint Charlie and the Eastside Gallery, we decided to go to the Konzerthaus and have a look. There was a tremendous outdoor cafe and buskers performing wonderful music. 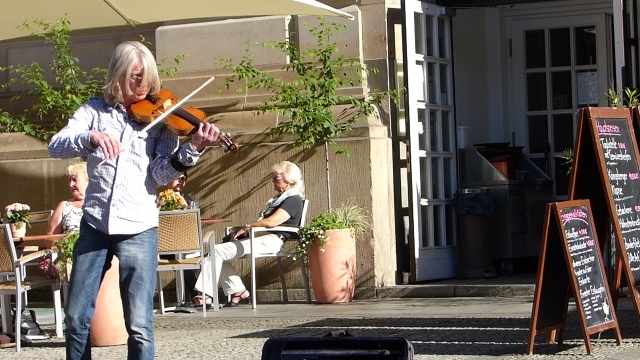 This was my favourite with his violin, his music immersed us into this scene of Berlin life. Berlin is turning on its best blue skies for us. 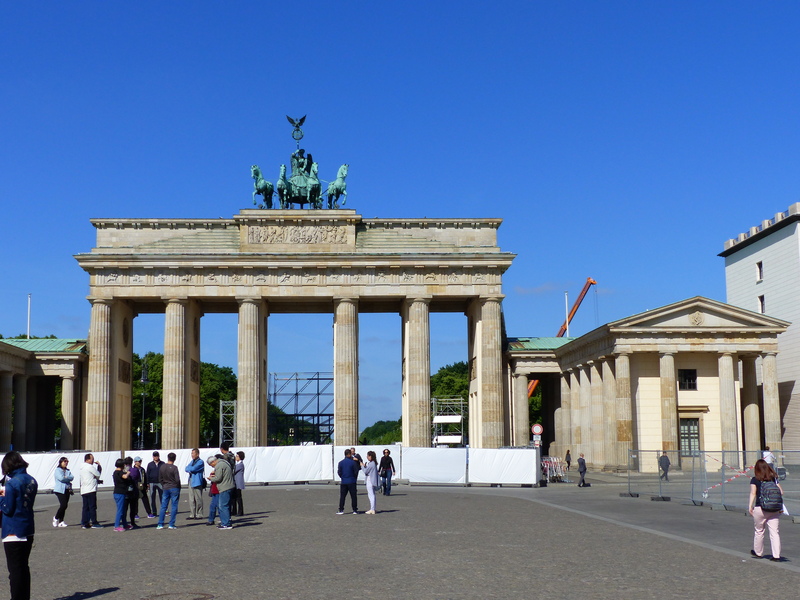 The Brandenburg Tor was magnificent, with the blue sky framing the city. Most of Berlin seems to hide behind a bit of scaffolding and bollards. The Brandenburg Gate was no different. We stroll back down the boulevard, flanked by Consulates, five star hotels and a Starbucks. The views above were not the views that President Reagan saw when he gave his inspired speech to “Tear down this wall, Mr Gorbachev”. He was looking from the Western side and saw the rear of the chariot. A potent message, for the past 30 years, that walls aren’t the answer. Several people asked if we stayed in East Berlin or West Berlin and it is hard to answer. We stayed in Mitte, Mitte meaning central or middle, was definitely split in the middle. But you can’t see the lines of East and West in this area today. It is so fresh and rebuilt so beautifully it is hard to pinpoint. Now there are quite a few embassies near the Brandenburg Tor and we went for coffee at Einsteins, we found out it was formerly the preferred coffee house for Russian spies and their friends. 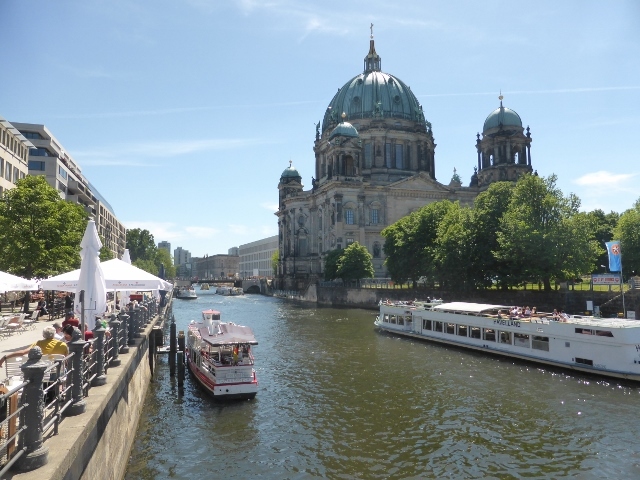 We walked to Museum Island, looking up at Humboldt’s statue then passing through a Pinch gut of a lane near the German Historical museum or Zeughaus. Stencilled onto the footpath, BEWARE PICKPOCKETS, three more steps and we are descended on by a swarm of people with clipboards, wanting to interview us. “Sign our petition”. We said No and continued walking, but they corned a Chinese man going the other way who screamed “No, No, No” in English and they swarmed him. Feral. Quite frightening. I hope he had his hand on his wallet and phone. You can’t intervene because part of the scam is that a “tourist” might come your aid and then as soon as you relax, he is off with your wallet. 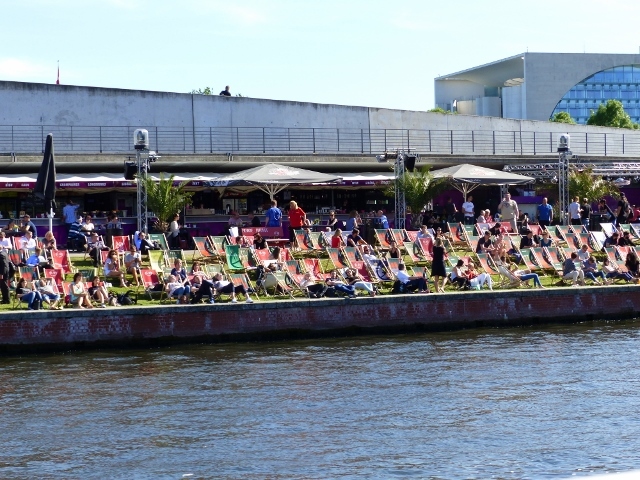 We spent several hours on Museum Island, a blog post in itself, but as the jetlag pressed in, we decided to go on a river trip on the River Spree. We needed the sunshine and views, after our thirty two hour flight and Berlin offered it in Spades.